Hot stone massage therapy uses smooth-surfaced river rocks that have been water heated to over 100 degrees. The warmth of the stones softens the muscles and allows the therapist to work on a much deeper level if the client desires. This heat accelerates blood and lymph movement, increases circulation and releases toxins from the body. In addition to yielding a blissful state of relaxation, the heat of the stones has grounding and healing effects. When intentionally placed on energy meridians, these stones balance and center the energy of the client. 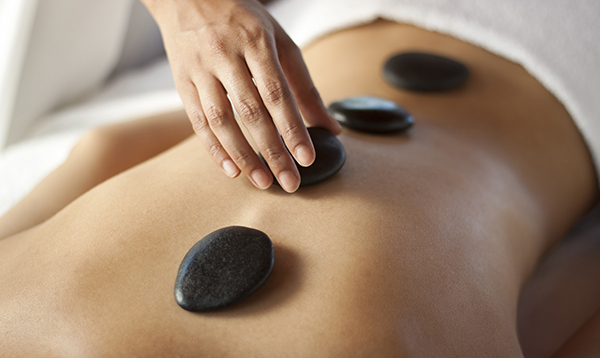 Hot stone massage therapy dates back over 5,000 years. It was used throughout India in the ancient healing tradition of Ayurvedic Medicine and in China as a means of improving the function of internal organs. Many other cultures have been known to place hot stones on the abdomen to aid in digestion and the Native Americans used this therapy to support detoxification, harmony and to balance the internal systems.